Yo, ho, ho, and a bottle of rum. Ahoy there me lads and lasses! Ye all know that aside from booty hunting and me parrot pet, another thing that me love is eating! Aye, ye can find me munching on different foods especially when there’s nothing to do in the Jolly Roger. One of me favorite foods since I was a little lad is popcorn and that has something to do with our app review for today. Batten down the hatches as we talk more about the app called Popcorn Chef by HEAT9. Get to know about this arcade app now in this review. 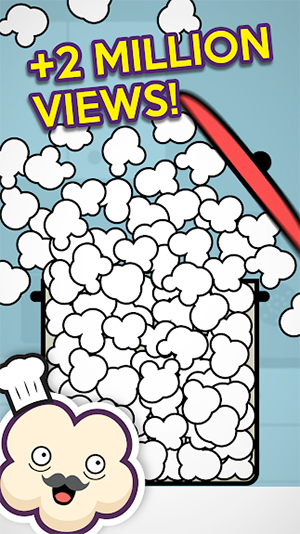 Popcorn Chef is one of those apps that you will think at first that you can easily pass. The basic gameplay is easy. Put just enough kernel corns so that they fill the container when they pop. The challenge is that the popped kernel corns should just be enough as too much or too little of it could end the game. You would definitely find yourself repeating the same levels before you can move to the next or even reach the end of the first stage, making it really challenging. There’s also a tutorial at the beginning of the game so you would know what to do. There’s not much going on when it comes to graphics, but it doesn’t mean that it’s bad. The simple but clean background and picture actually works well. It’s refreshing in the eyes. The background is light blue, although you can see that there’s a kitchen in there. The main focus is on the container, which you will attempt to fill with popcorn. The animation of the kernels being poured and the realistic sound of them popping are fantastic. 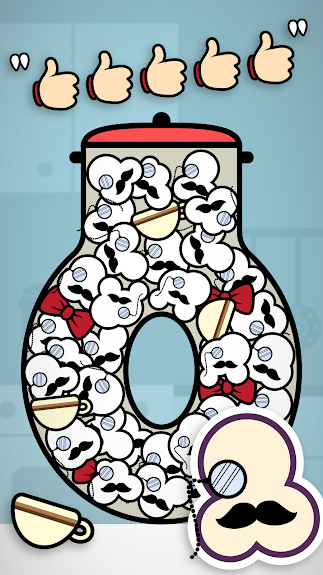 The different shape of containers and the various popcorn designs add to the fun of the game. This app is free to play and it comes with advertisements. Although there are times that the ads pop-up while in the middle of the game, they are only few compared to the ads of most free games, so they are acceptable. Popcorn Chef requires focus and patience. As mentioned, you need to pour only the right amount of kernel to get just the perfect amount of popcorn to fill the container. If you fail a level before reaching the first stop, you have to go back to the first level of that stage, which can be annoying and frustrating especially if you are not a patient person. It’s free and it doesn’t contain too many ads. It’s easy to learn but also challenging. It has simple and clean graphics that’s refreshing in the eyes. The animation and sounds will remind you of real popping kernels. It can be frustrating if you are not patient as it will restart on the first level of that stage if you fail any of the levels. If you are a patient person and you are looking for a challenging and fun game to keep you occupied, it’s recommended that you download Popcorn Chef. It’s original, it’s free, and it’s easy to learn, although difficult to master.